In 2016, UK retailers took £25billion in sales over the Christmas period alone, nearly half of which were completed on a mobile device. User experience (UX) agency Sigma, evaluated the hidden strategies that some brands use on their websites to boost sales in a report on the topic last Christmas. They revisited the subject this year, looking at tactics used around Black Friday, Christmas and the January sales. One year on from demonstrating an array of questionable design strategies – such as encouraging users to sign up to its Amazon Prime service, without clearly stipulating that the free trial would roll into a monthly payment – Amazon has been singled out once again for underhandedly attempting to upsell insurance products, by the same method. 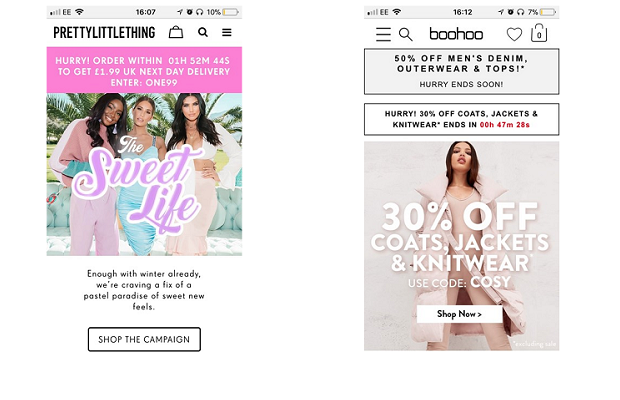 The research revealed that both fashion e-commerce sites are capitalising on the ‘fear of missing out’ by urging customers to complete their purchases before a ‘limited’ delivery offer is no longer available. However, it is unclear whether the offer is genuinely limited, or simply a countdown to a regular, daily occurrence. Shoppers may once again be panicked into buying an item at that moment, instead of taking time to reflect on whether it is what they really want or need. Commenting on the findings, Hilary Stephenson, managing director at Sigma, said: “Whilst we understand that the retail landscape is extremely competitive at the moment – particularly in an age where e-commerce sites can quite literally ‘pop up’ out of nowhere – it’s extremely concerning that big-name brands are using underhand tactics to try and squeeze more money, data or marketing channels out of consumers. “We had hoped to see an improvement on the use of Dark UX patterns since completing a similar analysis last year. However, it seems that these unethical practices are still very much in place. The examples listed above are just a brief cross-section of what we know is happening across the board – not just in retail, but in the leisure, travel and third sectors, too.